Ergonomic lifting systems fill the void between traditional lifting devices (such as a chain hoist) and completely automated robotic solutions – they are the custom solution that provides the highest level of safety and comfort for the operators. They enable operators to lift heavy loads and maneuver naturally as if the devices were an extension of their arms while providing a combination of pinpoint precision and blazing speeds that hoists and air balancers alone can’t offer. Using a combination of devices the ergonomic lifting process uses their human operator’s intelligence and adaptability for guidance while the actual lifting work is done by the device. These systems help improve productivity, reduce the cost of product damage, and minimize work-related injuries such as repetitive stress injuries. Well planned, ergonomic lifting, reduces workplace injuries and makes your operation more efficient. 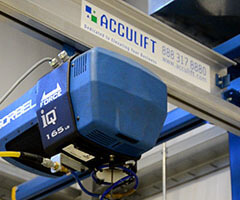 By utilizing a wide variety of products to meet a wide number of applications, Acculift’s ability to design solutions for industrial lifting needs allows us to serve a variety of industries. Whether you have a clean room application, require a specific weight lifted, a longer boom, custom end effectors, a taller crane, different load requirements, or a variety of other modifications, we can design an ergonomic lifting solution that will work for you. Download a whitepaper about ergonomic lifting in industrial settings here. An example of such a device, the Gorbel G Force Intelligent lift device that tracks with natural human movement, can be seen in the video below. Want to see a G-Force in action? We can show you!